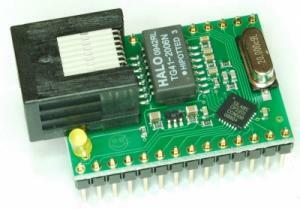 ioMate.NET V1.0 is a universal embedded ethernet interface module for connecting microcontrollers to the ethernet or internet. It utilizes Silicon Laboratories CP2201 ethernet controller with MAC and PHY. 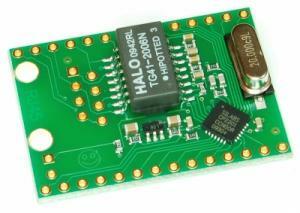 An ethernet transformer and voltage regulator is also included. See infosheet for details and links. Both ethernet driver and TCP/IP stack are available in free source code form. See infosheet for details and links. The module is shipped without pin headers, since everybody likes different types (up, down, male, female, etc.). A Connector Kit with high quality pins and receptacles, link LED and RJ45 connector.